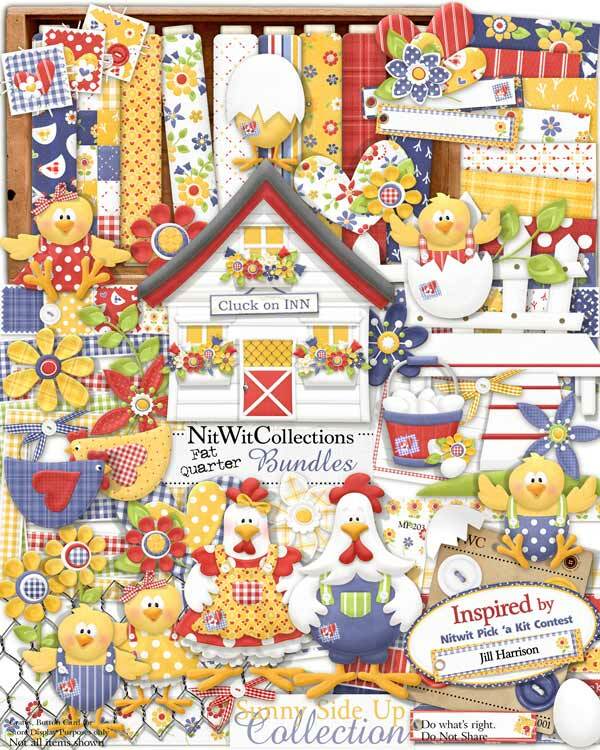 "Sunny Side Up" Collection is inspired by our Nitwit Pick A Kit 2013 Contest Winner, Jill Harrison! It is the perfect digital kit to create layouts and cards for all of your "fowl" friends and relatives! Created in the cheeriest of colours there are so many options of elements and background papers to work with including flowers, chicks, hearts, frames and of course the ginghams, ticking and homespun papers to mention only a few. Why not make something to cluck about?! 3 Bows in a bowtie style....Colonel Sanders wore one so why not you? 1 Chicken - a hen really....let's be politically correct! 1 Coop - fully decorated by the hens complete with flowers boxes....or a salad bar as they say! 1 Fence - nice, but as you can see all the chickens are loose.....built for beauty rather than function! 1 Platform for the chicken pageant perhaps?